See also squrave curved by ssaamm. This is a heavily-stylized semi-serif that really drives me insane somehow. At first I hate it, then I love it. I like to think that this was what squareon was trying to be. Info: Created on 22nd April 2010 . Last edited on 25th April 2010. At last something really unique and original in this so boring style. You made the impossible being possible. I am already taking a place in your head in the loving supporters side. SSSSSSSSSSSSSSSSSAAAAAAAAAAAAAAAAAAAAAMMMMMMMMMMMMMMMMMMMMMMMMMMMMM!!!!!!!!!!!!!!!!!!!!!!!!!!!!!!!!!!!!!!!!!! Some great characters in this strong design. 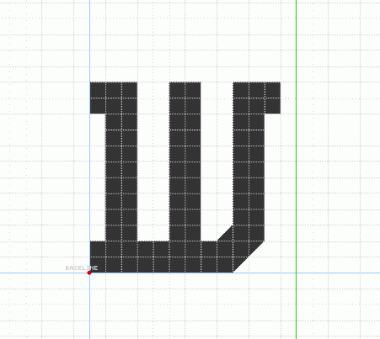 Perhaps the W is a little bit too narrow and the letter space of the f could go one square to the left. yeah, I like the wider one a lot better. 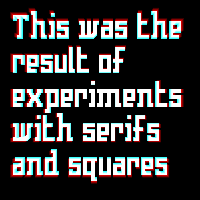 There are some pretty cramped letters in this set, because it was going to be monospaced, but I changed it. Congratulations! FontStruct Staff have deemed your FontStruction worthy of special mention. “squrave” is now a Top Pick. nice work. it seems your work has really progressed with this one being one of your most 'professional' you've done. you still have an edge to your work which is interesting to view as you continue to develop.